Spain set to pass law granting descendants of expelled Jews citizenship; US Jewish leaders meet king and political leaders. 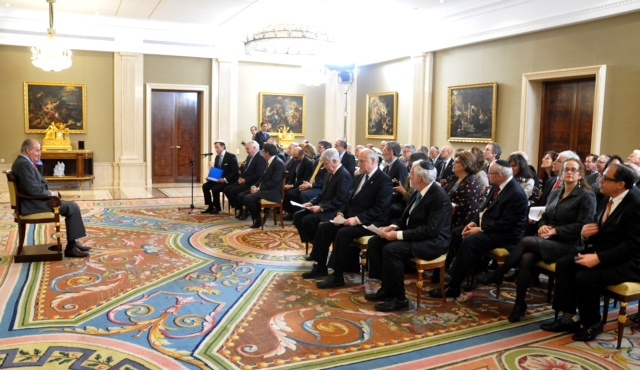 King Juan Carlos I of Spain met with sixty leaders from the Conference of Presidents of Major American Jewish Organizations on Thursday, in the umbrella organization's first official visit to Spain. The visit comes after Spain announced citizenship for descendants of expelled Spanish Jews last Friday. During the meeting, which took place at Zarzuela Palace, the King extolled the contributions of Spain's Jewish community to Spain before it was expelled in 1492 by King Ferdinand and Queen Isabela, as part of the Spanish Inquisition's efforts to convert or expel Jews. "Our history has been profoundly enriched with Spanish Jews' contributions to the arts and sciences, to commerce and philosophy. We are extremely proud of this legacy," remarked the Spanish monarch. The Conference of Presidents delegation praised the new Spanish legislation, granting citizenship for descendants of the community, as an "important recognition of the tragic events 500 years ago and the importance of educating this and future generations about it." The added their hopes that Spain will lead efforts against anti-Semitism and the threats of European boycotts on Israel. 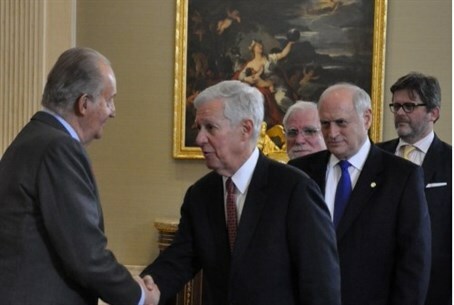 King Juan Carlos I said to the visiting Jewish leaders "Spain's doors are open to you now and always." The delegation also met with Justice Minister Alberto Ruiz Gallardon in Madrid, who said "we had to tell ourselves and the world that what happened was not only a mistake, but also that historical mistakes can be repaired." The new bill allows Jews to apply for Spanish citizenship while retaining their existing citizenship. It will soon be finalized in a vote in Spain’s Congress of Deputies. "I can assure you that the vast majority of Spaniards, no matter what their political stripes, whether they are in the government or in the opposition, agree with this assertion that we made a historic mistake five centuries ago and now we have the opportunity to repair it," Gallardon said. "So for this reason I am convinced that the draft law will receive the backing of the vast majority of parliament." Genuine repentance or a ruse? Spain has made some showing of repentance for its atrocious history of anti-Semitism. Last December, the Spanish Duke of Medina Sidonia presented a document of apology to the Jewish community of Gibraltar for the atrocities committed during the 1474-1476 expulsion of the Jewish community. Despite the signs of rapprochement, Rabbi Shlomo Aviner and other senior rabbis forbid Jews from taking Spanish citizenship in the new gesture, saying the move may be a political ruse to "make up for" the Inquisition and expulsion of Jews, which should not be forgiven. "Spain needs support at the moment - it is in a very difficult financial situation," noted Rabbi Aviner on Monday. "Suddenly they are courting us and giving us [dual] citizenship. An Israeli passport is worth more." Rabbi Aviner added "I do not see evidence that over the ages they have done anything to really compensate for the expulsion. ...If they really want to repent, they should at least stand by our side politically when we are attacked."